Enjoy hours of fun with this affordable Spalding / Huffy portable basketball hoop system. 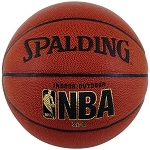 The Spalding / Huffy 72336 Portable Basketball System features a 44" Eco-Composite backboard, Slam Jam rim, and three piece, 3" pole for easy assembly. No need to deal with the hassle of drying cement, just fill the 37.5 gallon base with sand or water and start playing. Dimensions: 51" x 35" x 8"